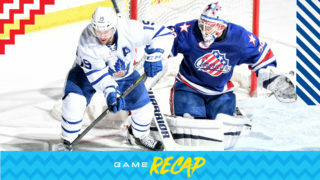 The Toronto Marlies played their final road game of the regular season on Friday night in Laval, taking on the Rocket. Neither team could find the scoreboard in a first period that was fast-paced and saw good, end-to-end action. Despite few whistles, neither team generated many shots on goal, as the two sides combined for just nine. 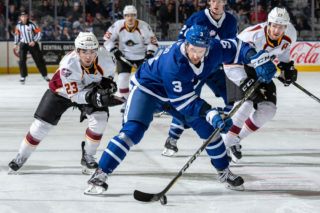 Carl Grundstrom scored his first of the season as he pounced on a loose puck off the rebound and knocked it home to put the Marlies on the board first less than four minutes into the second. It’s Grundstrom’s first goal in his first game with the Marlies after being reassigned earlier this week. Trevor Moore and Andreas Borgman had the assists. On the power play, Calle Rosen extended the lead midway through the second on a rocket from the blue line. Dmytro Timashov and Chris Mueller had the assists on Rosen’s fourth this season. 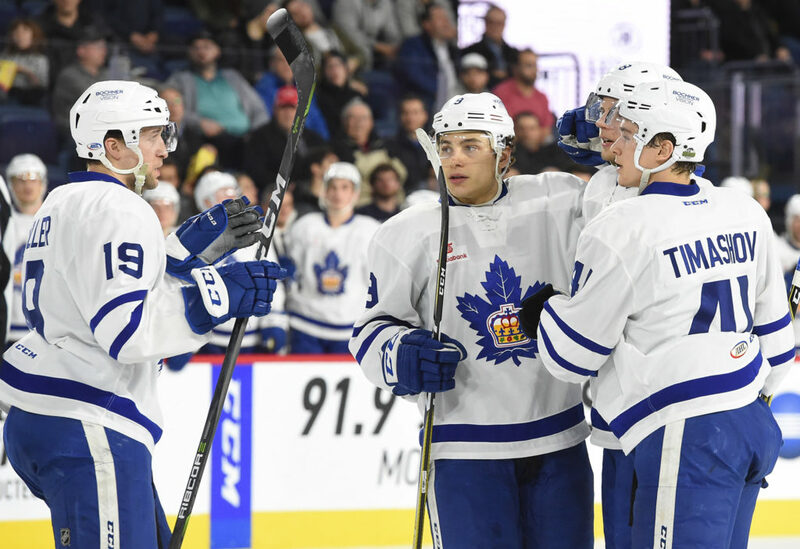 The Marlies continued to roll into the third as Chris Mueller and Ben Smith combined for back-to-back goals early in the final frame. First, Smith fought off two defenders and found Mueller alone in the slot for a one-timer that Mueller made no mistake on, making it 3-0. Three minutes later, Smith corralled a loose puck in front of the net and swept it to Mueller speeding in from the wing who shot into an open net. Martin Marincin, who took the initial point shot, had the secondary assist. With under four minutes to play, Rinat Valiev put Laval on the board, scoring his sixth of the season. That would prove to be the only time Laval could solve Garret Sparks, who made 24 saves for his 31st win of the season. With the victory, the Marlies improve to 52-18-2-2 and 29-5-1-2 on the road. 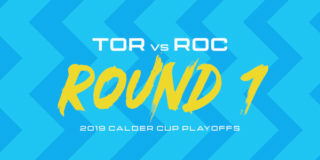 In the regular season series against the Rocket, the Marlies have now won ten of eleven games. At the other end, Laval moves to 24-41-7-3. The two sides will meet again tomorrow at Ricoh Coliseum at 4:00 PM. Fans can tune in on Leafs Nation Network and AHL Live. Carl Grundström scored at 3:38 of the second period. This was Grundström’s first regular season goal with the Marlies in his first game of the season. Last year, Grundström had four points (3 goals, 1 assists) in six postseason games with Toronto. Calle Rosen scored on the power play at 10:29 of the second period. This was Rosen’s second power play goal of the season. Chris Mueller scored at 2:13 and 5:14 of the second period and earlier had the secondary assist on Rosen’s second period power play goal. Mueller has 52 points (19 goals, 33 assists) this season. This is Mueller’s third straight season with 50-plus points. Trevor Moore recorded the primary assist on Grundström’s second period goal. Moore has registered a point (1 goal, 4 assists) in his last four games. Andreas Borgman had the secondary assist on Grundström’s second period goal. Borgman has nine points (4 goals, 5 assists) in 24 games this season with the Marlies. Dmytro Timashov recorded the primary assist on Rosen’s power play goal. Timashov has five points (1 goal, 4 assists) in his last five games. Ben Smith registered the primary assists on both of Mueller’s third period goals. Smith has 59 points (27 goals, 32 assists) this season. Martin Marincin had the secondary assist on Mueller’s second goal in the third period. Marincin has 20 points (4 goals, 6 assists) this season. Garret Sparks stopped 24 of 25 shots. Sparks is now 31-9-1-1 on the season with a .936 Save Percentage and a 1.79 Goals Against Average. Toronto went 1-for-1 on the penalty kill and 1-for-2 on the power play. Toronto had a 26-25 edge in shots in all situations. 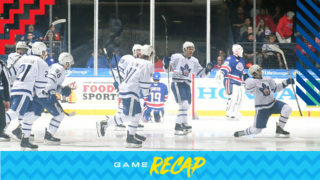 Chris Mueller led the Marlies with five shots on goal. The Marlies are 37-12-2-1 against North Division opponents this season and 10-1-0-0 against the Laval Rocket. The Marlies have outscored the Rocket 46-14 in the series. I thought offensively, it really took us awhile to really warm up in the game and adjust to how it is we needed to play so there wasn’t a lot happening for us in the first period. We played a patient game and that I liked. Stuck with it and got our goals in the second, didn’t give up a whole lot and then built our lead in the third period. All in all, it was pretty good things. These are hard games for our guys to get up for mentally this week, I was happy with what we did and how we did it. 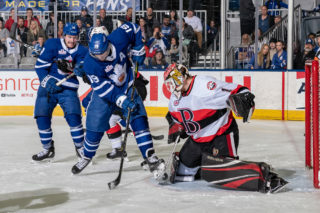 The Toronto Marlies are entering the final weekend of the regular season as Macgregor Kilpatrick Trophy winners, but are looking to build momentum heading into the playoffs starting out in Laval on Friday. It’s the first game of a busy three-in-three that will see the Marlies and Rocket face off on back-to-back days. The Marlies (51-18-2-2) have picked up a point in their past seven games, and have lost in regulation just once in their last ten contests. 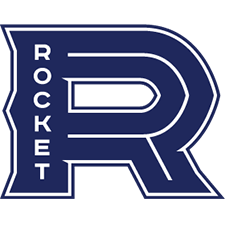 In the season series, the Marlies have won nine out of ten games against the Rocket (24-40-7-3), who have lost ten consecutive contests. Laval won the very first meeting of the season between the two sides back in October, but the Marlies have picked up the victory in each game since, outscoring the Rocket 42-13 on the year. 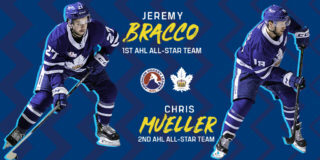 Chris Mueller has been the Marlies leading scorer against Laval, finding the back of the net three times and adding seven helpers in ten games this year. Jeremy Bracco, who has 11 points in his last nine games, is also producing at a point-per-game clip against Laval with one goal and eight assists in eight meetings with the Rocket. For the Rocket, Adam Cracknell has been the main offensive driver in the regular season series, earning five points (2G, 3A) against the Marlies this year. On special teams, the Marlies have held a sizable advantage against Laval on the season, converting on 25.5% of power play opportunities and killing off 92.3% of shorthanded situations. Puck drop tonight is scheduled for 7:30 and fans can tune in on Leafs Nation Network, TSN 2 and AHL Live, or listen in with Marlies Radio. Submit your guess for the Marlies first scorer in tonight’s game and you could win tickets to see the Marlies in the Calder Cup Playoffs. Follow us on Twitter for pre- and post-game coverage, as well as live updates from Place Bell.